With unmatched precision, speed and versatility ERAVAP is the instrument of choice for vapor pressure testing of e.g. 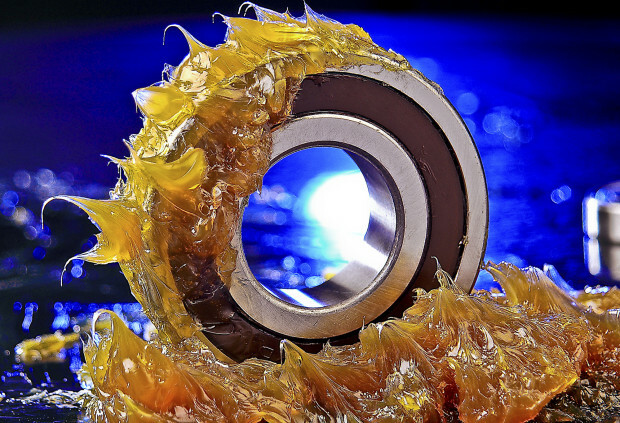 fuels, solvents, fragrances or aqueous solutions in full compliance with the latest international standards such as ASTM D5188, D5191, D6378, EN 13016. 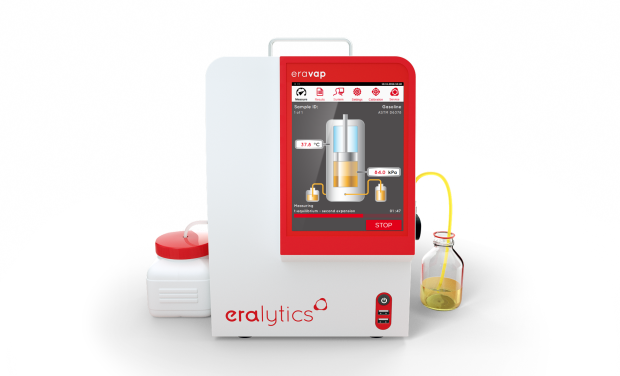 ERAVAP is a compact, highly precise, yet easy to use vapor pressure tester. A small footprint and the true portability even with an attached 10-position autosampler make it the ideal choice for stationary and mobile laboratories. The California Air Resource Board (CARB) relies on the unrivaled precision of ERAVAP as well as the U.S. EPA who uses ERAVAP as their reference instrument for vapor pressure testing. Additionally ERAVAP is field proven by the US Army with close to 100 installations in their mobile laboratories around the world. 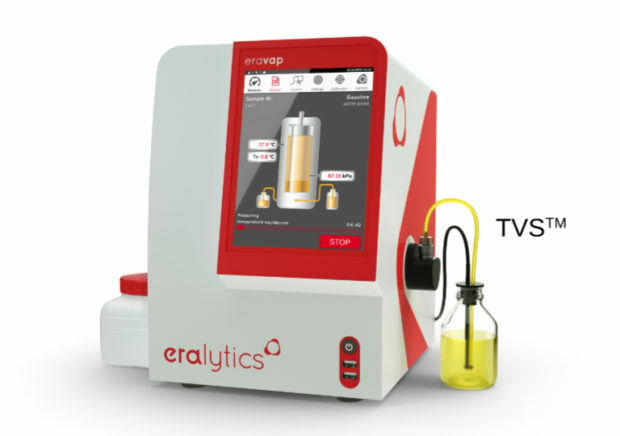 eralytics latest innovation (patent pending) for ERAVAP is the TVS™ – ASTM D5191 Temperature Verification Sensor for high precision vapor pressure testing of gasoline. This all-new temperature sensor allows easiest monitoring of the temperature directly in the sample container, featuring an immediate check of the sample preparation even before the actual measurement starts. TVS™ enables the specification of upper (and lower) temperature limits triggering an automatic warning, if the sample temperature does not match the requirements. 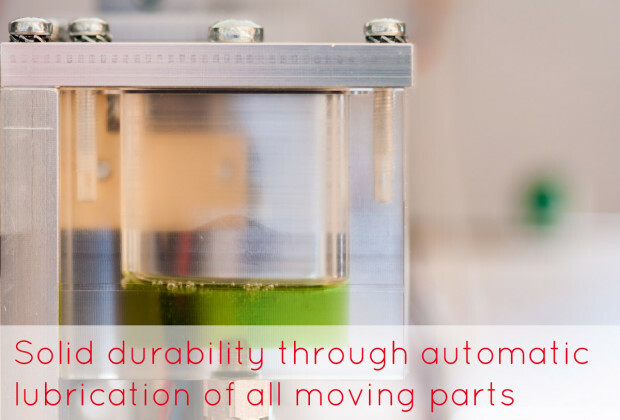 Thus TVS™ is a very efficient tool helping you to save time and money while improving the quality control in your testing lab. Recent improvements in the design of ERAVAP led to an improved repeatability and reproducibility for vapor pressure testing. With a repeatability of only r ≤ 0.15 kPa and a reproducibility of R ≤ 0.50 kPa for ASTM D5191 and D6378 reference materials at 37.8 °C (100 °F) it clearly outperforms the precision statements of its own ASTM standards. Using ASTM D6378 instead of D5191 for vapor pressure testing additionally eliminates any operator bias caused by incorrect sample preparation needed only for ASTM D5191. 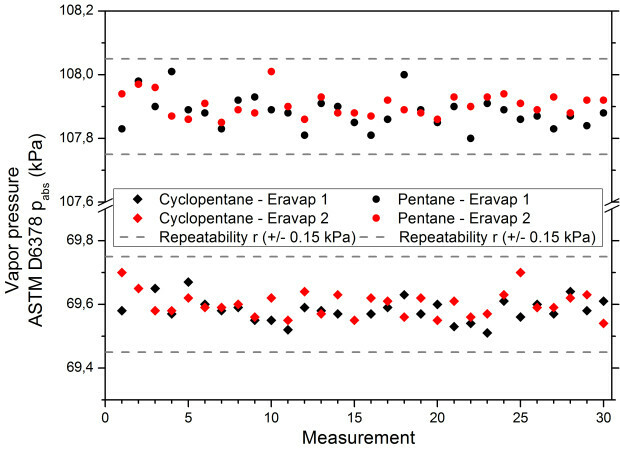 Please reference the graph for latest repeatability measurements of the latest ERAVAP generation using cyclopentane and pentane at 37.8°C (100 °F). With its quality-centric design ERAVAP was not only designed for highest precision but also for highest durability. The self-lubricating piston and the powerful Peltier elements are the instrument’s centerpiece. 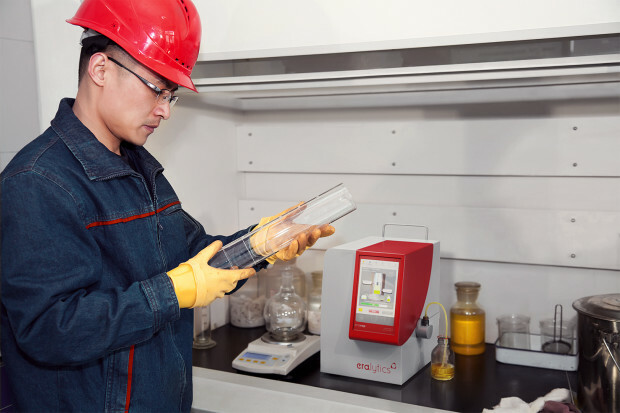 It is built for highest sample throughput rates at minimum maintenance. Furthermore, recalibration of the instrument can be performed without any special tools or disassembling the unit. 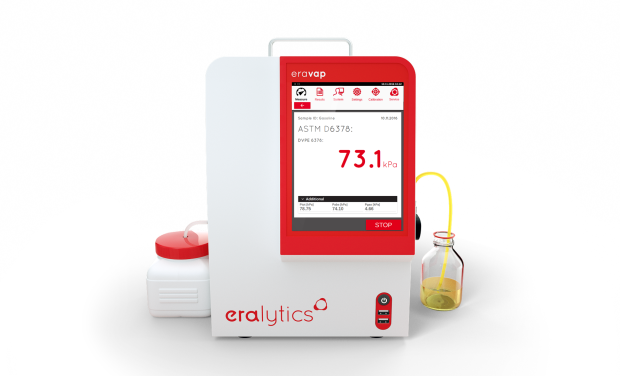 Eralytics patent pending Pure SamplingTM technology minimizes the possiblity of cross contamination between measurements. The area of applications ranges from freely programmable test methods for R&D labs to push-button simplicity. With its extended temperature range from -20 °C to 120 °C (4 °F to 248 °F) and V/L ratios ranging from 0.02/1 to 100/1 it can cope with the most difficult measurement scenarios as well as with routine analysis. Vapor pressure testing of up to 1000 kPa is possible. 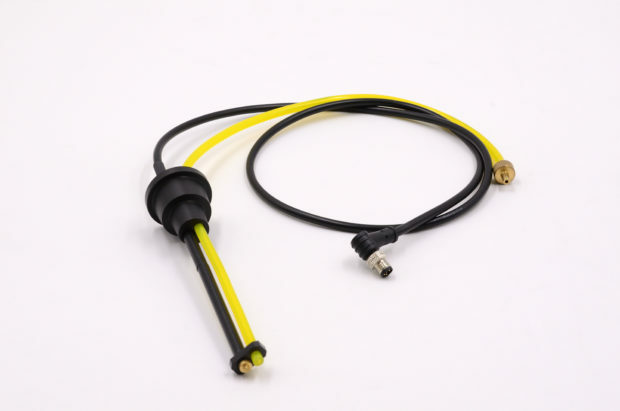 In combination with a 12 V DC adapter it can be even run by a vehicle battery, allowing vapor pressure testing in the field. 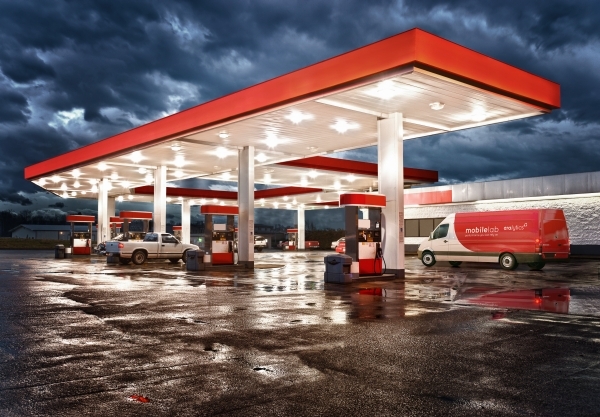 With its innovative design ERAVAP is capable of measuring gasoline, oxygenated gasoline as well as any other solvent or even polymers. It is used worldwide by refineries, terminals, oil and pipeline companies as well as authorities and independent laboratories. ERAVAP already covers a wide range of applications with its standard configuration. However, if the viscosity of the samples increases it gets more difficult to draw them into the measurement cell. In such cases heating up the sample prior to introduction helps. During the measurement the sample sitting in the tubes will cool down potentially blocking them after the measurement. ERAVAP’s new high viscosity extension heats the inlet and outlet as well as all transfer tubes up to 70°C. The temperature is regulated to a defined value set in the measurement menu of the instrument. Using this new module even further extends the applicability of ERAVAP to a new range of samples. The instrument now visualizes the measurement procedure on the screen showing the sample and piston position, as well as the temperature and pressure within the measurement cell. The resulting vapor pressure is calculated according to the relevant standards and displayed. Watch this video to get an overview on the sample handling and measurement procedure of ERAVAP.